When I joined Chillibreeze in the year 2015, the first thing that I heard was Office 365 and at that moment I thought it’s a new version of Microsoft Office application. It is a new version of Office application, and it is a cloud suite subscription application plus few other. At Chillibreeze, we have been using Office 365 and its applications since November 2013. A glimpse of what Office 365 is. Office 365, a product of Microsoft includes a group of services technically known as Software as a Service (SaaS) which are hosted in the cloud and makes collaboration much easier. Subscription includes a group of services for Microsoft apps and provides cloud storage services such as SharePoint and OneDrive. 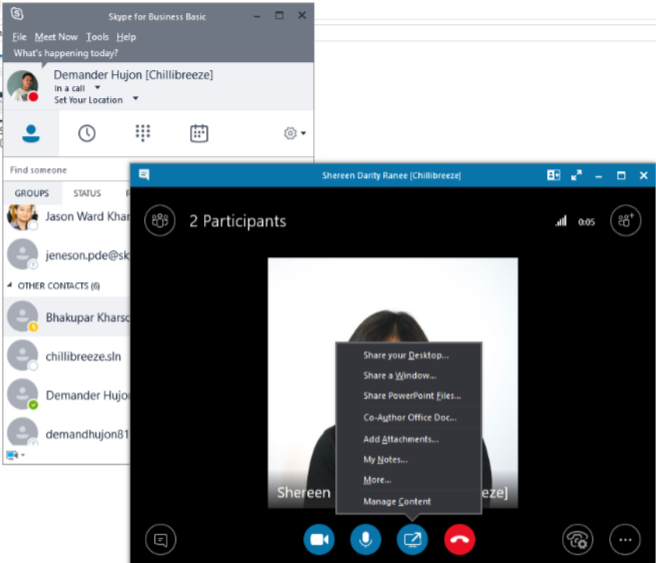 It also provides options for social networking through SharePoint, Skype for Business and Yammer, and an Exchange Online which is a cloud hosting mail service. There are different Office 365 plan which includes a list of cloud application, and also almost all of these plans include a desktop application software such as Word, PowerPoint, Excel, OneNote, Outlook, Skype for Business and Access. How we use Office 365 and its applications? With its many applications under one roof, it makes work easier and faster. Microsoft has become the core application for our daily work at Chillibreeze. Let us see to some of the services we use and their advantages. An email service which provides access to the exchange cloud server. Email is one of the vital services that help our business. Most of our communication with our customers is via emails. They send PPT decks for formatting and instructions all through email. So, it helps us connect and communicate internally and externally. Nowadays email security is a big concern, as 80% malware is targeted through emails. Office 365 is having an integrated technology for malware and spam filtering, and hence it automatically prevents any malware that encounters the mail server. This has helped us to work smoothly and securely. This is a dashboard which allows Office 365 administrator to control and manage all the email exchange service. Here we can have a single mailbox for a group of users and makes collaboration much easier among the users. For example, a company wants its members to collaborate on a project. They can easily see their mails from one mailbox. Here we can create a single mail address for a group of users so that users can send mail to multiple mail address using this unique email address or group. E.g., for our IT department, we created an email ID [email protected] (containing all IT members ID, also known as an alias/group). Our colleagues can just quickly send a mail to this ID when it is related to IT department. All members in the alias can receive the mail. Here we can monitor the emails transport and deliver. We can view which emails are delivered and which are not. A service for instant messaging that allows users to collaborate anytime, anywhere, any device with a high-end security on the conversation. We can quickly schedule an online meeting instantly with as many as 250 users! Microsoft keeps updating this application with many useful features. Now we can easily record our Skype conversation, share our screen with our peers, share our presentations and notes and create a whiteboard. SharePoint is a cloud-based collaborative platform. It is a tool that provides storage and synchronization for personal data or files through OneDrive for Business sync client. SharePoint Admin Centre is a site collection platform where team sites can be created within the SharePoint site. We have been using this feature to create different sites for different departments and clients with various permission level. SharePoint offers a secure storage facility for documents and a safe platform for collaboration. It integrates with Security and compliances service that allows us to customize security alerts or any level of safety for SharePoint sites. Apart from these features, we are also using features such as Calendar, Notebook, and other web/app parts. We are using SharePoint Designer to customize our SharePoint sites. Yammer is a private social networking service that is provided for organization to communicate and collaborate internally/externally. It comes along with an Office 365 license. One tenant of Office 365 can create only one primary Yammer network. Yammer group is also now becoming Office 365 group, and this has help us to be systematized and easier in our collaboration. In Yammer we can also integrate different apps such as Recognize app, which is the most useful app for us as for now in Yammer. Through this app we can recognize any employee for their exceptional performance and values. A cloud service in Office 365 that enables users to discover other users’ profiles, a collaboration between users where users can edit or share files through SharePoint, OneDrive for Business or Yammer. Delve has been the tool that we use to organize all the shared files, add files to favorites so we can easily find whenever needed, share the files easily with peers, and post the files on Yammer whenever we want to talk or collaborate with members in Yammer. Microsoft flow is an automation tool like any other workflow tool. It allows automating our team or business process by building a workflow. We develop a workflow between apps such as SharePoint, Outlook emails, and all Microsoft applications. E.g., We can build a workflow to send a notification whenever a file in SharePoint is modified or a workflow to send a push notification whenever we received a mail from the particular client. We can also include integrated tools into flows such as Azure Resource Manager and the Azure Portal, PowerShell and xPlat CLI, Visual Studio, and additional connectors. Microsoft Team is a platform where people can chat, organize the meeting, attach files or notes and collaborate each other. Since the time of its launch, we have been using this as a platform to collaborate with teams for different projects. We create teams involving peers working on the same project. Here, for any updates on the project, we just easily chat and share files when needed. We schedule meeting easily from the app whenever needed. It has a desktop version too that helps us to easily access the apps. PowerApps is a platform that allows users to create and customize functional apps that can be useful for business. Users need not be from a technical background or a coder. There are pre-built templates that we use to build apps. There is also an option to create templates from scratch. Since we are using Windows 10 machine, we are using PowerApps Studio for Windows to create apps. Our apps are created using the applications database like OneDrive for Business, SharePoint and Dynamic 365 where we stored our data. E.g. we created an app from SharePoint data containing contacts. PowerApps build its default app and we can view and edit the details. We can customize the app as per our needs by changing the layouts. Office 365 has proved to be a powerful tool for Chillibreeze. There has been an immense improvement in how we manage projects, communicate and collaborate with the users both internally and externally. Compared to the years before Office 365 was introduced in Chillibreeze, we can say that it has made work for us so much easier and faster.